Here’s a simple Middle-Eastern inspired salad whose slight sweetness makes it a good foil for other Middle Eastern specialties like hummus, tabbouli, and baba ghanouj. 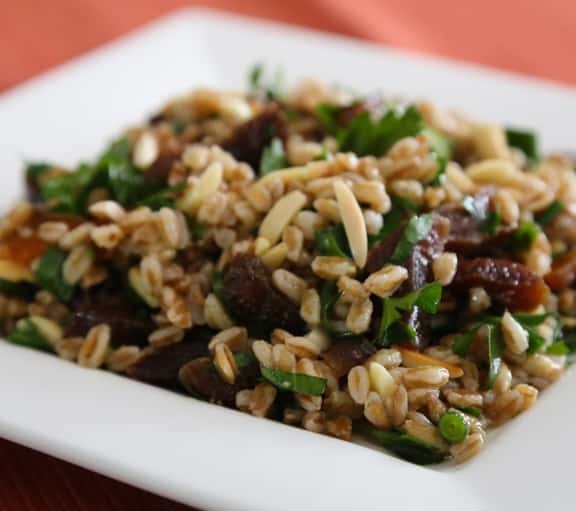 This is great with ordinary barley, and is a good way to highlight farro, an ancient hard wheat, as well. Photos by Evan Atlas. Bring 3 cups water to a boil in a large saucepan. Stir in the barley or farro, return to a boil, then reduce heat and simmer, covered, until the water is absorbed, about 30 to 35 minutes. If the grain is too chewy for your liking, add an 1/2 cup water and allow to cook until absorbed; repeat as needed. Transfer the cooked grain to a serving container and allow to cool to room temperature. Add the remaining ingredients to the cooked grain and toss together well to combine. Let stand for 15 to 20 minutes to allow the flavors to mingle, then serve at room temperature. Time saving tips: You can soak barley or farro in water and refrigerate overnight to reduce cooking time. 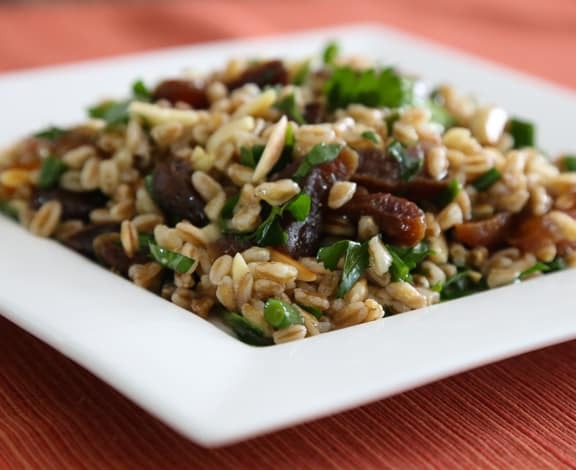 You can also look for quick-cooking farro, but you’ll have to double the amount called for above, as it doesn’t swell up as much as when using the regular grain.